OK fans, THIS should be your new favorite holiday dish. I don’t care what you celebrate, we all celebrate deliciousness. There’s a little prep work involved, but it is worth every juicy morsel. 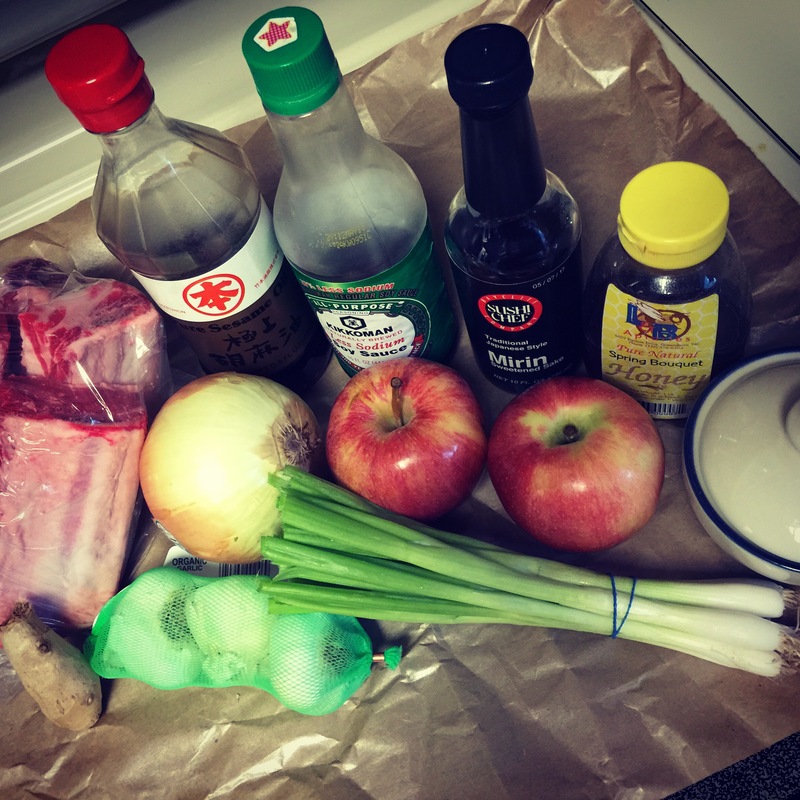 I am making this dish for the upcoming Jewish New Year… and perhaps Halloween. Thanksgiving. Christmas. And an early happy Valentine’s Day to me. Since the beef is the focal point of the entire meal, I wanted to make sure I had quality beef and plenty of it. 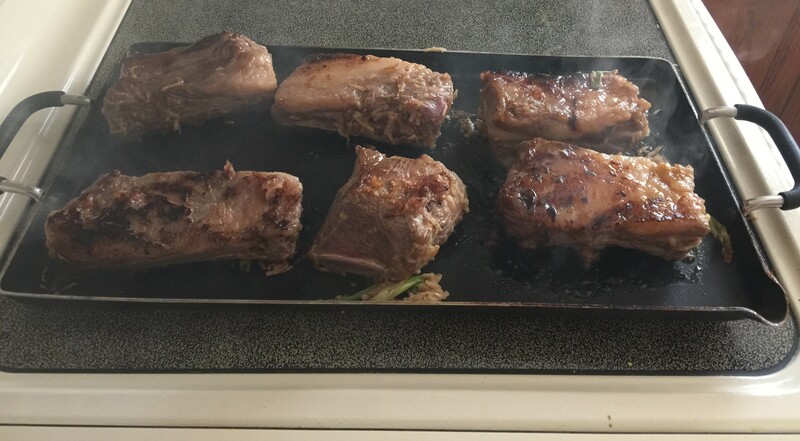 I bought six short ribs equally just over three pounds. That sounds like a lot, but you have to take into account the bones. We each ate two ribs at dinner. You can adjust the serving size as needed. I served my meat with green beans tonight and that’s eat. I mean, it. I’m still thinking about eating those short ribs! Marinating the meat is essential to get the flavors going and the apples to break down and tenderize the beef. I soaked mine for 24 hours– you could do as little as 6-8 hours, but I wouldn’t go much more than a full day. I first tried to fit everything into a gallon size bag, but that was a futile effort. You could use a bowl or storage container. I like to keep these HUGE bags on hand exactly for this type of need. Whatever you use needs to fit back into the refrigerator, don’t forget that detail! 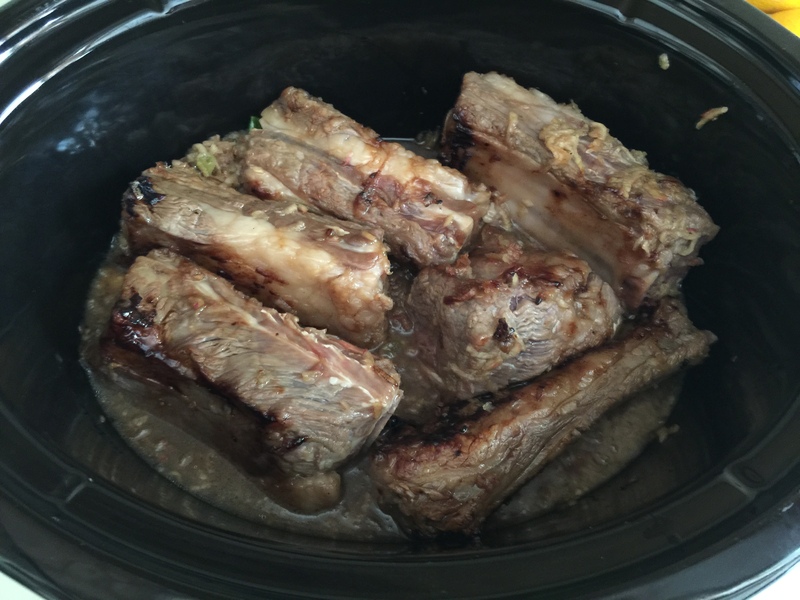 Crock Pot Short Ribs is one of the only recipes where I braise the meat before I put it into the crockpot. 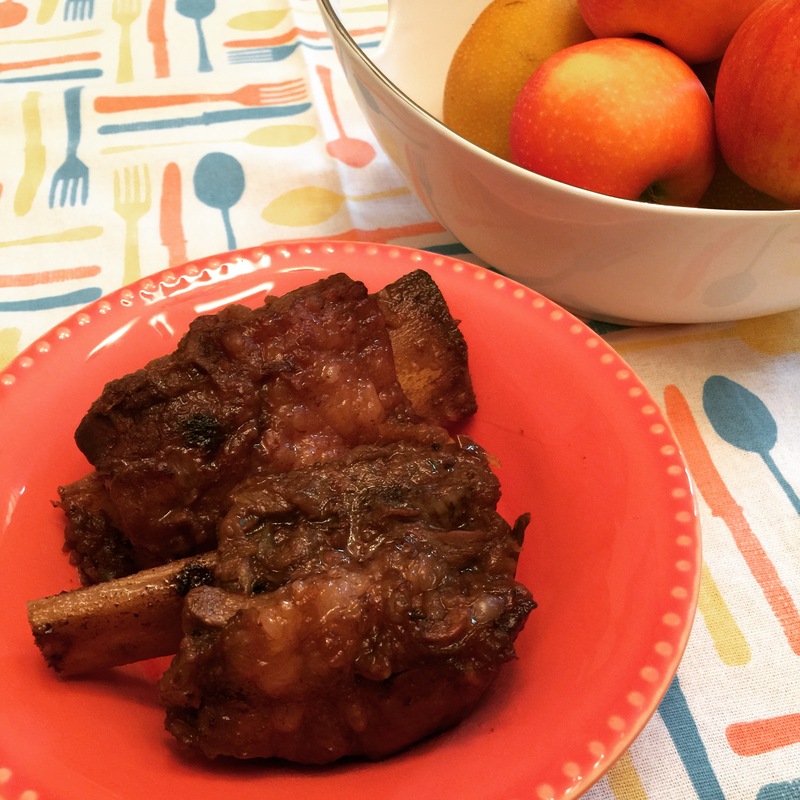 The flash of heat helps caramelize the flavors quickly and seal in the juices. It’s worth the extra step, trust me! It’s also necessary in my house to open the windows or disarm the smoke detector when braising. Something about that quick heat and sugar causes some excess “fog” in the air— that’s what my kids call it, cooking “fog”! 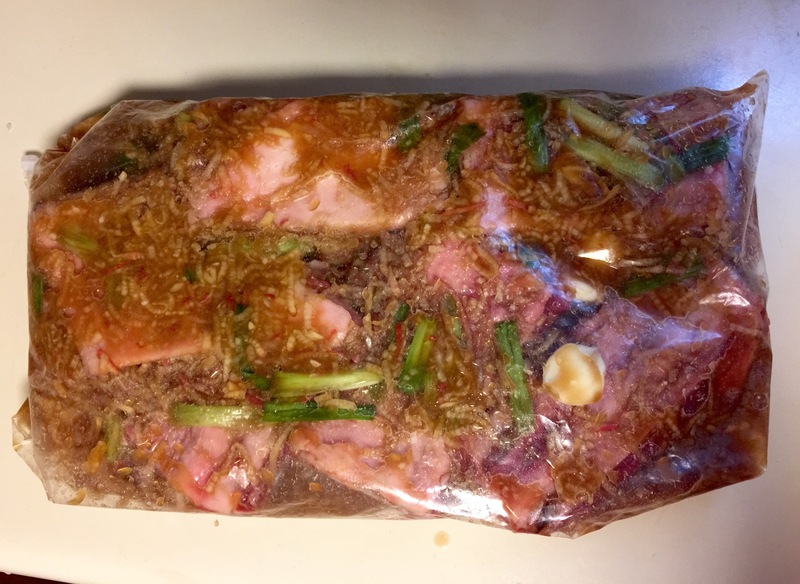 When you are braising the meat, make sure you save the juices and marinate from the bag or container– that goodness goes straight into the crock pot. Do not dump it out! Once the meat is done braising, you just gently place the meat on top of the sauciness and let it continue its cooking all together. Yes, there are more steps to this dish, but the end result is soft and juicy and smiles all around. And isn’t that the point of holiday meals?! Happy everything to you. I hope you enjoy this dish and everything you celebrate throughout the year. Begin by shredding onions, apples and ginger and put into large bag or bowl. Add garlic cloves and green onions. Add remaining ingredients (except ribs) and combine well. Add beef short ribs and massage marinate onto all sides of meat. Cover bowl tightly or seal bag and refrigerate for up to 24 hours. When you are ready to proceed, remove ribs from marinate and put everything else into the crock pot. 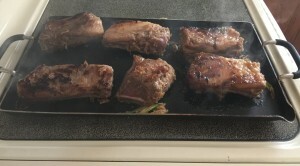 Heat pan on high and then braise all sides of short ribs quickly, but do not cook through. Add ribs to mixture already in crock pot, cover and cook on high for 3-4 hours or low for 4-6 hours. The meat will pull away from bones when it is soft and ready. Serve bone-in with extra juice. The whole cloves of garlic will taste amazing- do not throw them out- spread them on bread or eat like candy!